Our standard delivery charge is £5.95 for the majority of UK mainland addresses. This is for our standard delivery service which is made within 1-2 working days. This is our standard charge for the majority of our packages. Working days are Monday to Friday, We are here Monday to Friday during working hours, orders placed overnight will be processed the following day, orders placed on Fridays, Saturdays and Sundays will be processed on Monday. Deliveries are usually made between 9am - 4pm Monday- Friday. No time can be specified and a signature is required on receipt. Goods can be left on your property without a signature; however this is at your own risk. Deliveries can not be guaranteed! Whilst we can control the process of your order, and confirm the departure of a shipment from our warehouse by a quick call to ourselves, it is of course then in the hands of the carrier company. Carriers can understandably be affected by road conditions and adverse weather amongst many other unforeseen issues. This price does not include Saturday delivery - if you require a Saturday delivery please call us on 0151 334 0222 and we can quote you for the additional cost. Certain UK postcodes regretfully incur a surcharge: For Example - Scottish Highlands and Islands (FK17 - 99, G83, IV1-28, IV33-39, PA21-23, PA35-40, PH18-26, PH30-42), Off-shore which includes Isle of Wight, Isle of Man, Channel Islands, Scilly Isles, and Northern Ireland. If your postcode falls within a surcharge area we will contact you before we dispatch the goods. *If you are unsure about your area, please telephone for a quotation. Shipping outside of the UK will incur surcharge on the delivery e.g. Ireland, France, Germany etc. Please ring with your five digit postal code. Please note: We are unable to economically ship certain items to off shore Islands due to their size and fragility. Customers are always very welcome to collect in person, please check availability before travelling, or can arrange their own shipper. *Large Fridges, Glass Door Ovens, Air-conditioning Units,* are all priced according to Destination post code and weight and are a palletised delivery, again please ring for a price. We regularly ship very big orders as palletised loads for extremely economical prices, again please ring us. Special information! At busy times.... Orders are picked and dispatched in strict received order. At busy periods we sometimes have to make 'cut off' times earlier than normal, particularly on Mondays. Occasionally you can also receive dispatch confirmation automatically from the courier, Unfortunately this does not guarantee the parcel will be delivered the following day, due to route logistics and transfer between the couriers own depots. Our availability of items is unfortunately not on a live stock system and can occasionally be over subscribed, over night or at weekends, Please contact us on 0151 334 0222 for live availability or with any concerns over when you will receive your goods! We are here and happy to help from Monday to Thursday, 9.00 to 17.00 and Friday 9.00 to 16.30. PLEASE CHECK THE CONTENTS OF YOUR DELIVERY IMMEDIATELY, THE GOODS MAY GET DAMAGED IN TRANSIT. Under no circumstances can we accept a claim for loss or damage if the goods are signed for as "in good condition", "unexamined" or "unchecked" you must sign as "damaged". in the event the goods appeared to be ok and on checking were not, then you must phone us within 48 hours of delivery, and within 24 hours of a pallet delivery. Customers booking engineers etc to fit equipment based on the assumption that goods will arrive undamaged and on the expected delivery day do so at their own risk. Jacksons Leisure Ltd can not be held liable for any costs incurred. If you require a Saturday delivery, please call us on 0151 334 0222 after placing your order. You can request to have your order left without signature, or to have the order left with a neighbor. Please specify clearly where you would like your order left or call us on 0151 334 0222. If you request goods to be left without signature, e.g. "Round the back of the house" or "On front porch" etc this is at your own risk - we cannot take responsibility for goods that are subsequently stolen or found to be damaged. Returns are only acceptable if the item is returned in its original condition, within 28 days of the date you received the item, new and unused (with any seals and shrink-wrap intact) and we will issue a full refund for the price you paid for the item. Our suppliers reserve the right to alter colour and update the specifications of their products without prior notification. We suggest customers email us if colour or updates are an issue before ordering, we can then confirm the current stock specifications. Details are correct at time of listing, we can not accept return requests based on the colour or updated specifications not matching the listing. Shipping and handling charges for returns are borne by the buyer. Dometic products come with a two year manufacturers warranty. https://www.dometic.com/en-gb/uk/find-a-dealer. These are to be used for items such as Fridges, air cons, cookers etc. (Coolboxes and other smaller items come through us). Commercial use voids warranty. Thetford products come with a three year manufacturers warranty. https://www.thetford-europe.com/dealers-service-centres/ Commercial use voids warranty. All gas & electrical appliances i.e. Fridges, Cookers, Air Cons etc. must be fitted by a qualified engineer. Failure to do so can invalidate your warranty. Warranty procedure sometimes requires a product to be taken to an approved service partner; customers who call out a “mobile” engineer from one of these partners should note the call out charges incurred are not covered as part of the warranty. 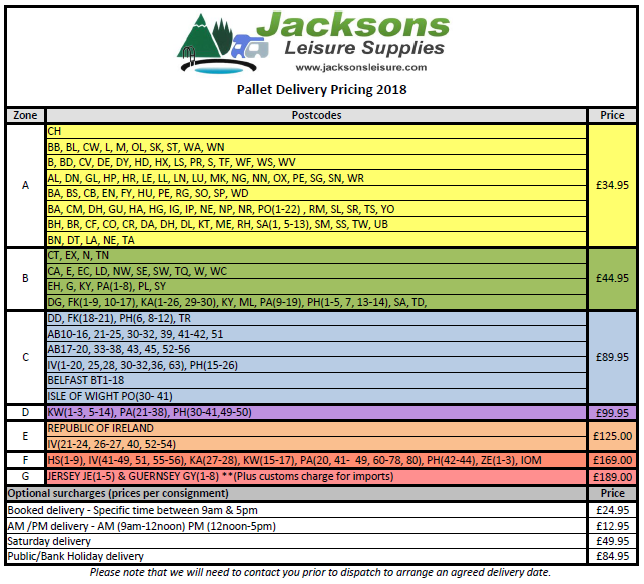 Please note that unless specified or advised to the contrary by us in writing all products sold by Jacksons Leisure Supplies are NOT intended for commercial use. Please note, the information contained within these terms and condition does not affect your statutory rights. By law, consumers in the European Union also have the right to withdraw from the purchase of an item within 7 working days of the day after the date the item is delivered. The item should be returned in its original condition, unopened and with any seals and shrink wrap intact.